The scale of futures trading on the oil market--and commodity markets more generally--is a novel feature of the current financial scene. 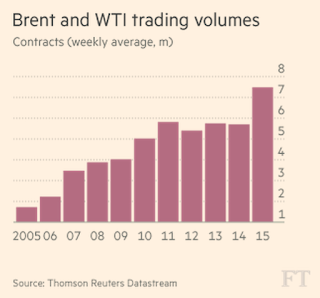 According to the Financial Times, "Daily average turnover has increased from 350,000 futures contracts in 2005, when electronic trading started to dominate, to 1.5m--or 16 times the world's global daily oil demand." Currently, funds control around 510 million barrels of oil in the New York and London futures markets--"equal to more than five days of global demand, or the combined monthly output of Saudi Arabia, Iraq and Iran, the biggest producers in OPEC." The impact of the shale revolution and fracking on the oil market is well known; less well appreciated, according to David Hufton, an oil broker, is the impact of "financialization." According to Hufton, "Futurisation of oil has been as dramatic in its impact as the arrival of horizontal drilling and fracking . . . Fracking transformed oil supply dynamics; futurisation has transformed the factors driving oil prices." The FT piece contrasts the big movement of macro funds into oil futures with the abundance of oil in the physical market. The supply overhang is also emphasized in the following chart from Britain's Telegraph newspaper. It cites a recent oil market report from the International Energy Agency warning that over supply has reached 2.1 million barrels a day. "Iraq, Libya and Russia are all cranking up output, and Iran is waiting in the wings with an extra 400,000 b/d of quick supply if there is a nuclear deal." A miracle of modern finance is how the markets respond to government reports that are known to be often inaccurate and heavily revised. The inadequacy of the surveys and methods used to compile these reports (especially the market-moving employment report) is often neglected when the markets respond to the release; the “headline number” is all that matters. Hall believes the recent fall in output as shown by the blue line is very bullish for the oil price, though it might be noted that the adjustments, though showing a steep fall recently, still show production above the normally consulted weekly output figure. Paul Sankey, an energy analyst at Wolfe Research, also cited the trend in a report Thursday to investors. 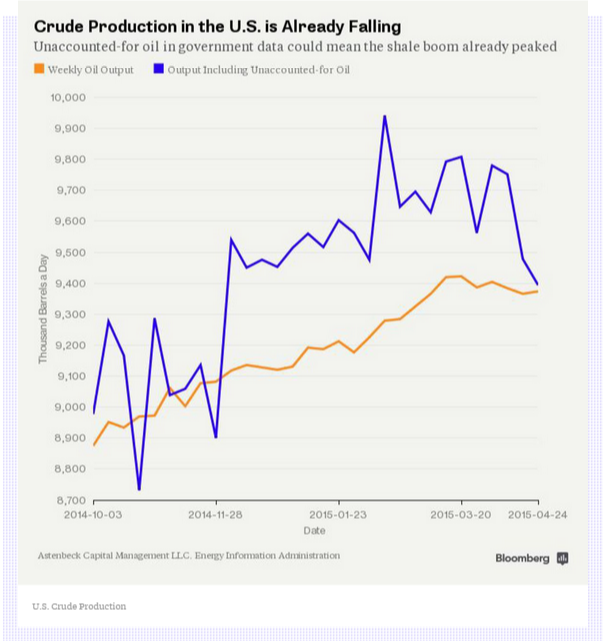 The amount of production that isn’t accounted for has fallen “dramatically” in the last two weeks, suggesting U.S. daily output may have fallen by as much as 200,000 to 300,000 barrels in April, he said. “That number seems high to us, but it does support the notion that U.S. production is rolling over at present,” said Sankey, a former analyst at the Paris-based International Energy Agency. Update, May 12: The question of EIA statistics becomes curioser and curioser. The latest was a blast on Monday against the EIA for gross incompetence in its methods of data collection. 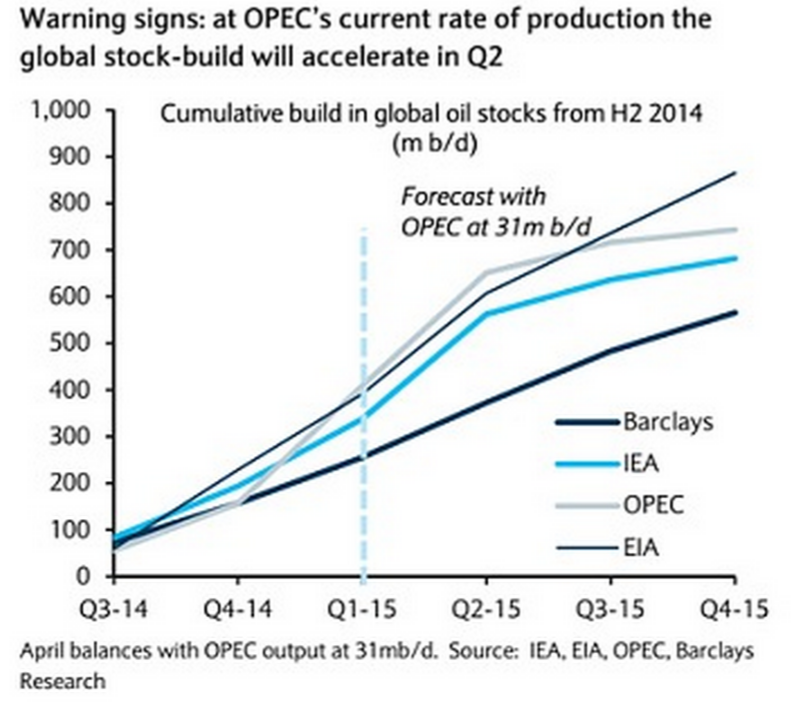 The EIA, charged oil analyst Philip Verleger, was overestimating U.S. output by as much as 1.6 million barrels a day. The glut the markets had previously identified was seemingly non-existent, a “phantom.” Verleger was previously on record as predicting that oil prices would fall back to $50 a barrel by the end of the year, a prediction predicated on the existence of a supply glut. So this was a big reversal for him, and it was for oil markets, if true, a very big deal. There follows the Monday story in the FT, followed by excerpts from its Tuesday report. Wednesday may bring further clarification, but it would seem, on the face of it, that the heat of Verleger’s denunciation on Monday seems rather misplaced given his reversal on Tuesday. A prominent oil analyst has fired a broadside at the body charged with data collection on the US oil industry, saying it has probably overestimated the country's crude output by as much as 1.6m barrels a day. This is a large variance that could have enormous implications for the global economy. 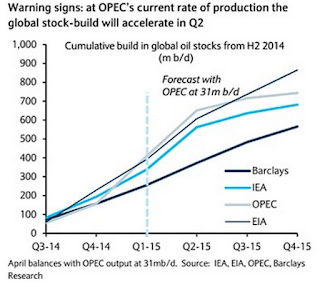 Prices will be higher because the [supply] glut was phantom. Federal Reserve policy could easily have been different had the error been understood. The EIA, which acts as the statistical arm of the Department of Energy, declined to comment. Mr Verleger, who runs consulting firm PKVerleger and advised both President Gerald Ford and Jimmy Carter administrations on economic and energy policy, was one of the few analysts bearish on oil before last year's dramatic collapse in prices. Last week he forecast a further decline in prices, which have rallied sharply since reaching $40 a barrel in January. On Monday, Brent, the international marker, was trading at $65 and the US equivalent, West Texas Intermediate, was at $59.50. 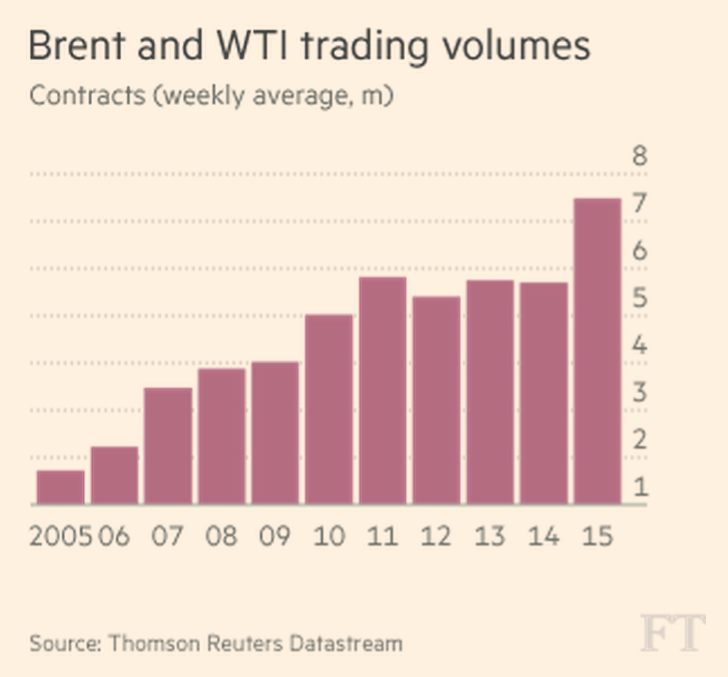 The rise in oil prices… has baffled many who believed global stocks were surging. Global stocks would have done so had the numbers been correct. Analysts say investors should be careful how they interpret US production statistics, in particular the EIA's weekly short-term supply numbers. This is because they are based largely on modelled estimates, not hard supply data from the field. In a recent analysis of historical estimates against lagged production data, Citi found short-term EIA forecasts underestimated final data by as much as 200,000 b/d over the last year. Mr Verleger has come to different conclusion but says the EIA's reliance on estimates and "failure" to make contemporaneous accuracy checks of its numbers is a "dereliction" of responsibility on the EIA's part. Rarely if ever had a US agency charged with collecting data made a miscue of this magnitude. The EIA administrator should be dismissed immediately for gross incompetency. "Notwithstanding a widely-reported note alleging that EIA's domestic crude production data are probably overstated by 1.6m barrels a day, EIA management and staff are confident in the quality and validity of the agency's production data. Furthermore, EIA's monthly crude oil production statistics, based on official State oil and gas data have been closely aligned with the weekly estimates reported by EIA," it said in emailed comments. "Turning to the larger items in the balance equation, EIA directly collects data on refinery crude runs, changes in crude oil stocks, and crude oil imports every week. We are confident in the quality of these data. Unless the reported runs data, the stock data, and the imports data are massively wrong, production cannot be overestimated by 1m to 1.6m b/d as alleged," it added. 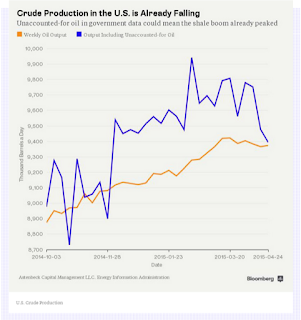 The Oil Recovery in 2009: A Precedent for 2015? The first chart below shows the perambulations of the oil price from the bottom on December 24, 2008 to June 1, 2009. The second chart shows the oil price movement from late January 2015 to the present (May 1). Note that the first chart shows six months, the second chart four, so they do not exactly align. In both cases, there was a big rally off the lows (December 24, 2009 and January 29, 2015), with rallies failing over the next month to surmount the level achieved in the first week's big rally, then a retest and brief penetration of the lows about six and a half weeks from the original low (February 12, 2009 and March 17, 2015). At that point a rally begins that over the next six weeks sends the price through resistance and up to a new level. Note that the new level achieved is about five or six dollars above the previous resistance (from c. 49-50 to c. 54-55 in 2009, from about 54 to 60 today). If the past is prologue, we can expect WTIC to meander in May 2015 in the sort of way it meandered from late March to late April in 2009. That is, it would probe support on the downside, sufficiently so to trigger stops, but without breaking through for more than a few hours, followed by rallies that probe resistance on the upside, but which also fail to break resistance (60) over the next month. The next chart gives a closer look at the price action from March 20 to May 1 in 2009. From the highs to the lows is around 6 to 7 dollars. The next chart shows the approximate range (from 60 to around 53.5) of the price action I expect over the next month. Historical precedent suggests that the oil bulls will have to wait till June 2015 for the surge above 60, and that bears will have some opportunity over the next month, but they shouldn't get too greedy. That is my (educated) guess. One should note that there are many differences between the overall financial and energy context in early 2009 and early 2015. The oil bottom occurred about a week after the stock market low on March 6, 2009, when it was apparent that the world economy was experiencing a deep recession (thus crushing oil demand). There is nothing like that economic backdrop today, and still the oil price has recovered (from $42 to $59). On the other hand, the Saudis were attempting to support the price in early 2009, and now they are attempting to suppress it. Despite these differences in context, it is remarkable that the first three months after the initial lows of late 2008 and early 2015 have followed a similar pattern. Just for the hell of it, two more charts that show the ratio between the Brent price of oil and Euros in 2008-09 and 2014-15. In neither instance were the initial lows (of late-December 2008 and mid- January 2015) retested. Finally, for a broader perspective, here's West Texas Intermediate from May 1, 2008 to May 1, 2010.
. . . A series of government and academic studies over the past few years — including at least two reports released this week alone — has added to the body of evidence implicating the U.S. drilling boom that has created a bounty of jobs and tax revenue over the past decade or so. Until recently, Oklahoma — one of the biggest energy-producing states — had been cautious about linking the spate of quakes to drilling. 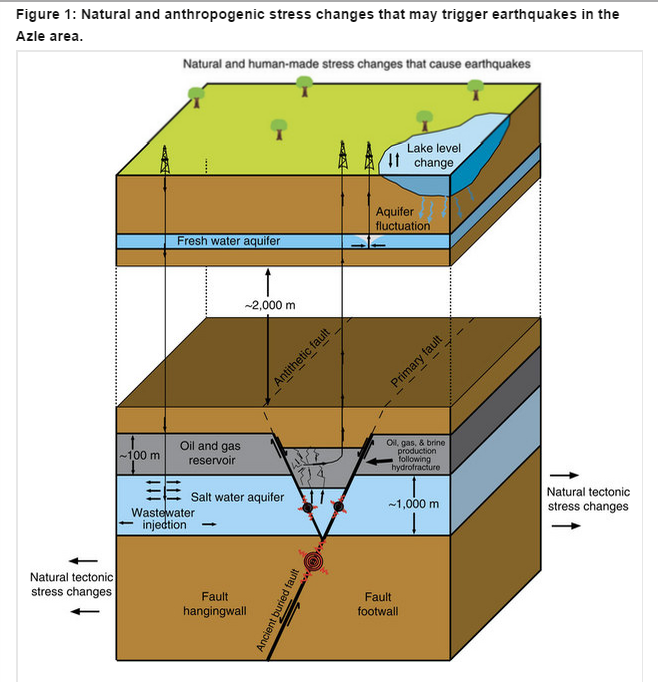 But the Oklahoma Geological Survey acknowledged earlier this week that it is "very likely" that recent seismic activity was caused by the injection of wastewater into disposal wells. The largest jolt linked to wastewater injection — a magnitude-5.6 that hit Prague, Oklahoma, in 2011 — damaged 200 buildings and shook a college football stadium. The following temperature map from Bloomberg shows the hottest start to a year on record. "Results from the world's top monitoring agencies vary slightly. 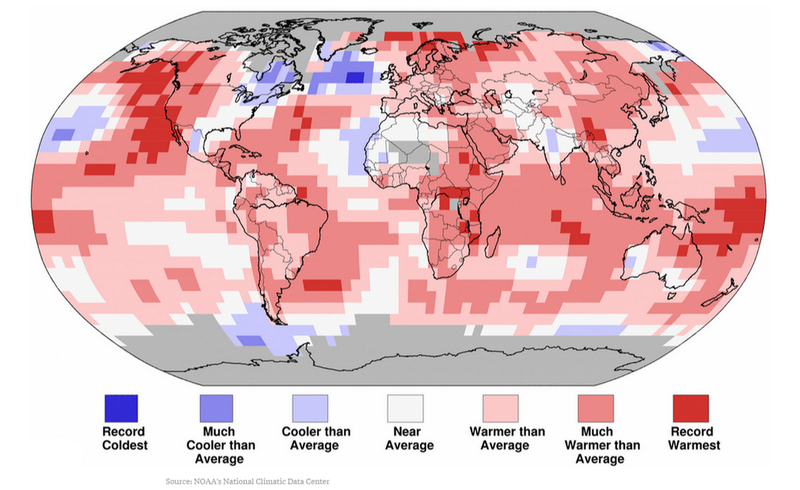 NOAA and the Japan Meteorological Agency both had March as the hottest month on record. 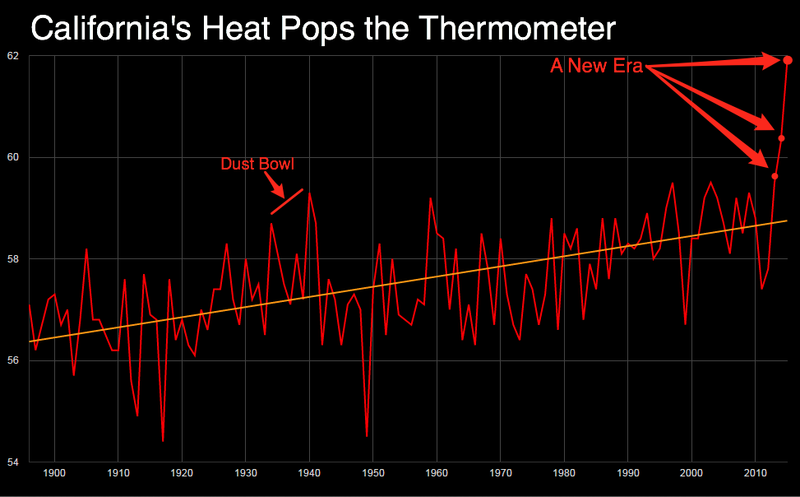 NASA had it as the third-hottest. 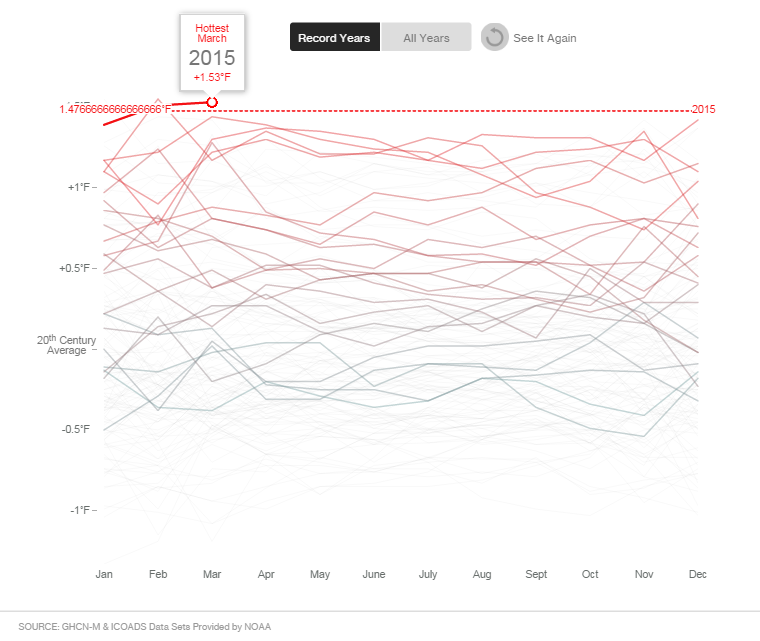 All three agencies agree that the past three months have been the hottest start to a year." Tom Randall and Blacki Migliozzi, Global Temperature Records Just Got Crushed Again, BloombergBusiness, April 17, 2015. 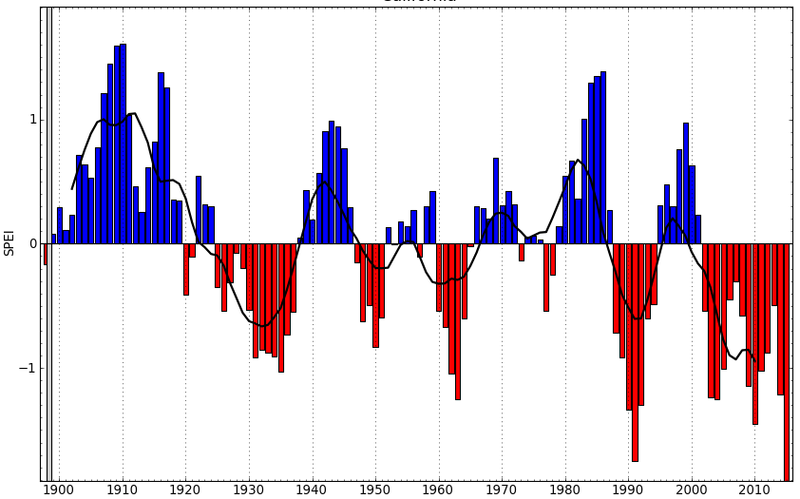 The piece also includes an illuminating animation recording monthly temperature measures for about 135 years. This is a screenshot of the most recent image from March 2015. This chart, put together by Andrew Smithers, shows the contrasting rewards to capital and labor over several generations. The blue line (left scale) is profits before depreciation, interest, and tax, as a percentage of output. The red line (right scale) represents employment costs as a percentage of output. After a fairly stable set of relations in the post-World War II period, reflecting the New Deal consensus, a yawning gap emerges in the 21st century. This is not your mother and father's capitalism, it would seem, but a system of political economy very different in salient respects. The chart helps explain the relative out-performance of US equities as against world stock markets, noted in a previous post. The piece appeared in 2012, so the data is a bit old, but the disparity has probably gotten larger in the last few years. Smithers was bearish on the stock market in 2012 and, assuming mean reversion, believed shares to capital would recede and shares to labor would increase. Since publication on December 26, 2012, the U.S. stock market is up 54%. The chart appears in an NPR report introduced by Paul Solman, consisting of an interview between Jon Shayne and Smithers, a noted student of financial history. ANDREW SMITHERS: All output is for somebody’s benefit, either those who work for the firm (the labor share) or those who provide the capital (the profit share). 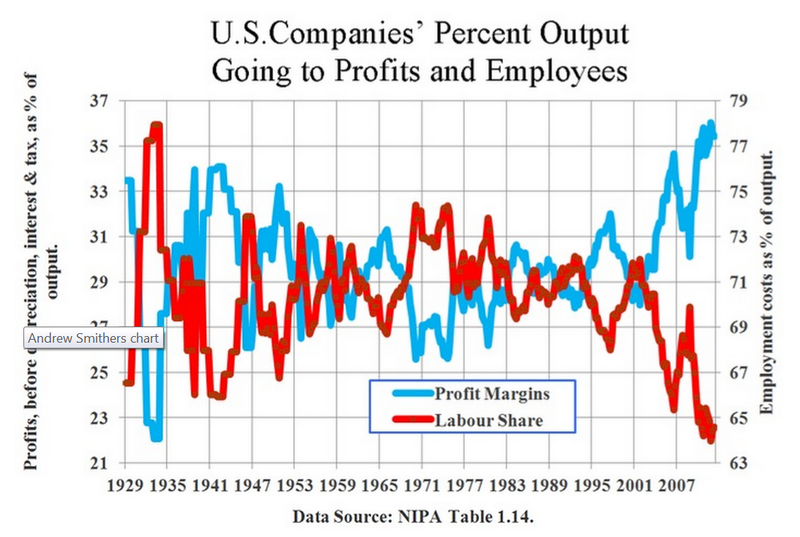 Labor’s share has never been lower or the profit share higher. These shares of course add up to 100 percent, before the government has taxed both labor and capital. JON SHAYNE: What do you think has caused labor’s share to fall below its average to a new historical low, and capital’s share to rise to the higher highest peak ever? ANDREW SMITHERS: The change in the way company managements are remunerated has been dramatic in this century. Salaries have ceased to be the main source of income to senior management, with bonuses and options taking over. There has been major change in management incentives and it should not cause surprise, though it evidently has to most economists, that management behavior has changed. The current incentives discourage investment and encourage high profit margins. This is dangerous for companies’ long-term prospects as it increases their risk of losing market share and reduces their ability to reduce costs. It is very damaging for the economy, but it maximizes the income of managements. Senior management positions change frequently, so if management wish to get rich, they have to get rich quickly. I am not alone in this diagnosis. A recent report from the Federal Reserve Bank of New York comes to the same conclusion from a theoretical analysis as I have come from data analysis. JON SHAYNE: How do bonuses today encourage profitability above investment? I guess you mean that they are tied to changes in earnings per share, or return on capital, rather than to the growth of companies’ output? ANDREW SMITHERS: Yes, the current way in which managements are rewarded is perverse from an economic viewpoint. Adam Smith pointed out that some characteristics of human beings such as greed, which are often unpleasant at a personal level, can nonetheless bring social benefits. But this is not necessarily the case under current remuneration systems; greed is increasingly the cause of harm rather than help to the economy. JON SHAYNE: On the graph, do we know how much of labor’s share represents what managers earn? If their share has gone up over the decades, through stock options and the like, which I believe is the case, then the average worker is getting even a bit less than it looks, correct? ANDREW SMITHERS: Yes, there have been two major changes. First, the share of output which goes to all employees has fallen to its lowest recorded level. Second, the proportion of total remuneration that goes to the higher paid has shot up. Both of these changes have been bad from the viewpoint of the average worker. The result is that current management reward systems are producing both economic damage and social disquiet. . . . 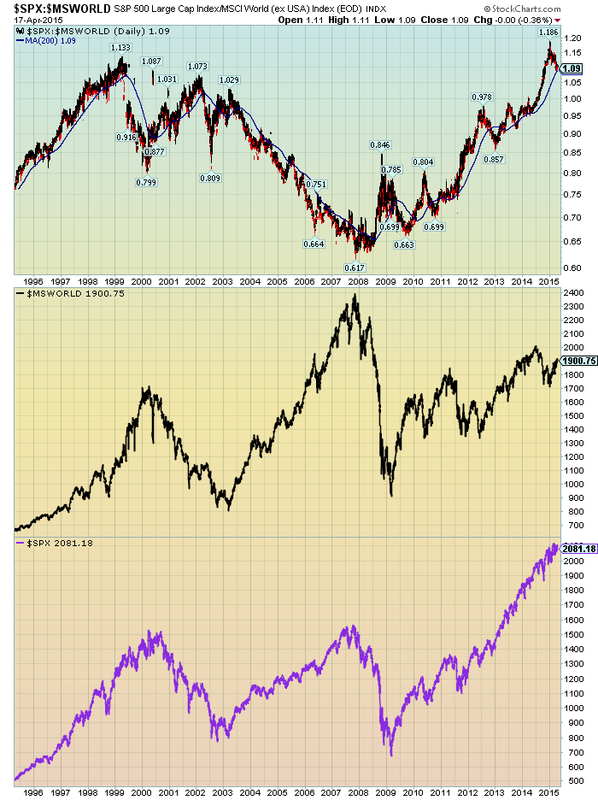 The following chart shows a ratio between the SPX (the S&P 500 US stock index) and the MS World Index (an international equity index that excludes the U.S. market). It shows the dramatic disparity between the U.S. and foreign equity markets since the financial crisis and the ensuing Great Recession. As the separate price indices in the two panels below show, the world index is barely above the level it reached in 2000, whereas the S&P 500 long ago surmounted the twin peaks of 2000 and 2008. 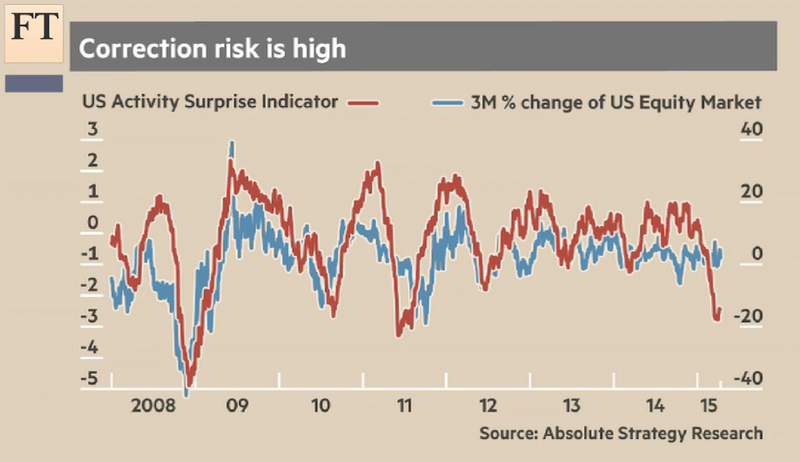 The chart supports the general conclusion that international stocks are a better bargain than domestic stocks. The ratio turned on or about January 1, 2015, and has barely looked back since. Apart from the overall disparity in valuations suggested by the chart, there are additional reasons for thinking the ratio line will continue trending lower. One is the collapse in oil prices, which disproportionately benefits big oil importers (Europe, Japan, China, India). Another is the turn of world central banks to quantitative easing. QE may or may not be healthy for the overall economy, but it has undoubtedly been very, very good for U.S. equity investors. The U.S. Federal Reserve purchased $3.75 trillion of debt in its various QE programs. Observers called it the "Bernanke put," meaning that the Fed had put a floor under the stock market, but it might more justly be thought of as the "Bernanke call." The effect was to send U.S. equities into the stratosphere. The end of the U.S. program and its embrace by others (especially the Bank of Japan and the European Central Bank) is another spur to relative outperformance by the world index as against U.S. equities. Here's another look at the disparity between U.S. and world equity indexes. EFA is the etf for the EAFE index, which covers developed markets in Europe and Asia. EEM is the etf for the stocks of emerging nations. 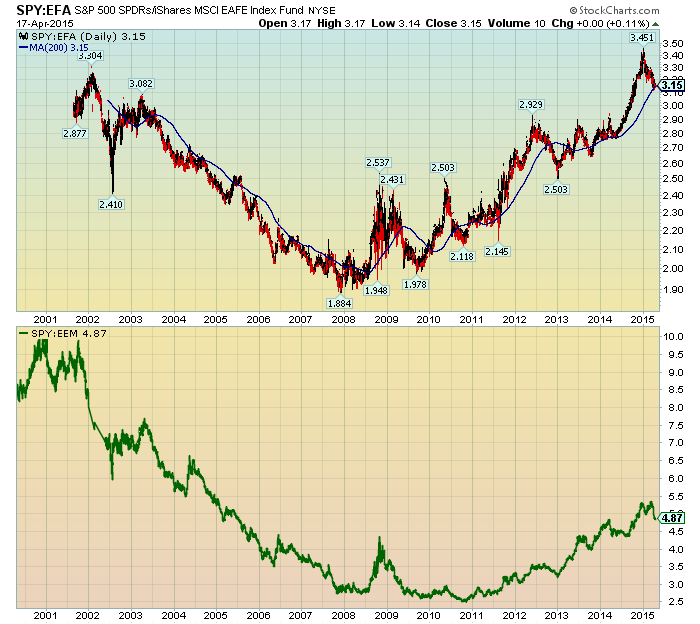 The first chart shows the SPY:EFA ratio, the second the SPY:EEM ratio. Update, 4/26/15: Underlining the disparity in valuations as between U.S. and international markets is the following statistic from Barron's: "Even when smoothing out the most recent bull market—which the Shiller CAPE (cyclically adjusted price/earnings) ratio does by averaging 10 years’ worth of earnings and adjusting for inflation—U.S. stocks seem pricey. The S&P 500’s CAPE ratio is 27, well above its median of 16. The rest of the developed world, meanwhile, averages a CAPE ratio of 17, below its median of 22.5, according to Research Affiliates." Chris Dieterich, International-Focus ETFs Beat U.S. Counterparts, Barron's, April 24, 2015. For a thorough examination of issues associated with global stock market valuations, see numerous entries in the excellent blog Philosophical Economics, especially this one from August 2014. 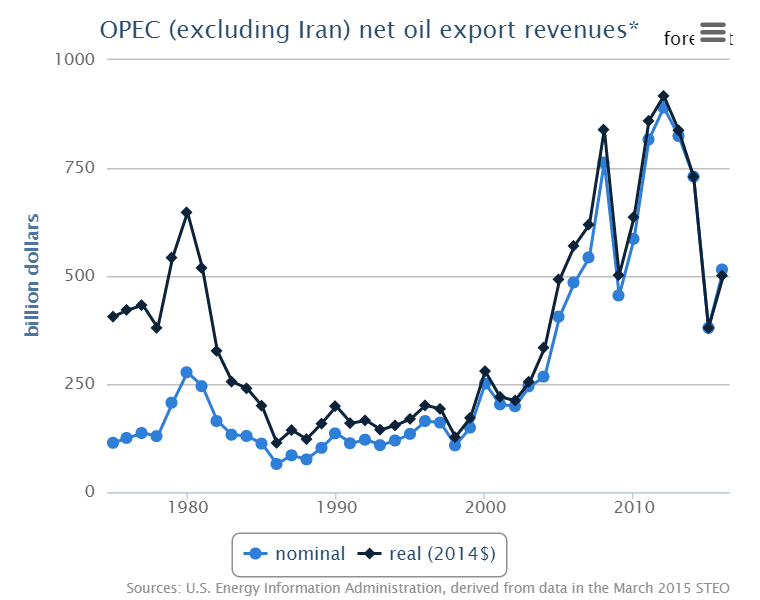 A new report from the Energy Information Administration shows net oil export revenues for OPEC over the last 45 years. The graph excludes Iran, noting difficulties in estimating Iran's earnings. Oddly, the EIA seems not to include Iranian data for the entire 45-year period; they would have done better to make an estimate for the last few years than to eliminate Iran from the whole series. Despite this omission, the graph speaks volumes. It shows the return of the energy crisis in the last decade, outdoing even the first great go round in the 1970s. 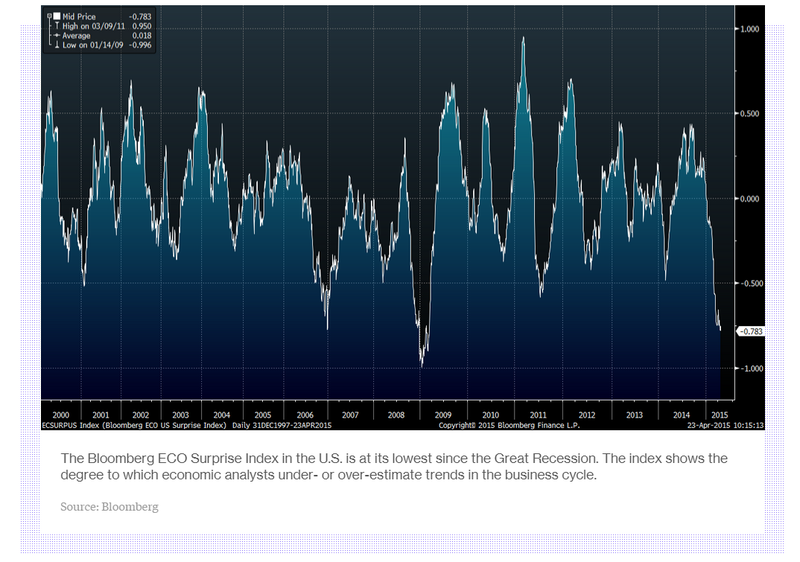 It gives a vivid picture of the explosion in energy prices from $10 a barrel in 1998 to $145 a barrel in the summer of 2008--inducing shocks that played a significant role in precipitating the Great Recession. The figure also shows how volatile the energy sector has been over the last ten years. Two spectacular rises, two spectacular falls, all in less than a decade. OPEC oil revenues also have played a key role in shaping the US current account balance, especially in the last decade. 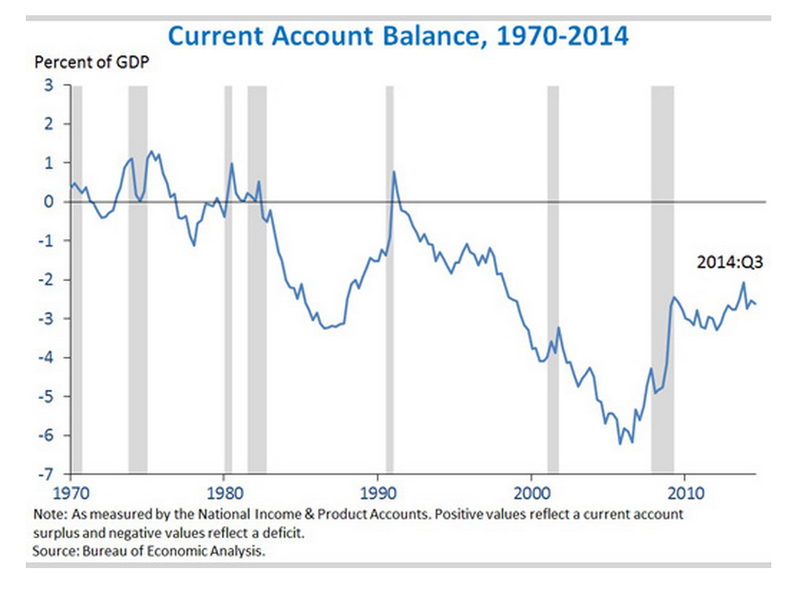 The following graph from the Council of Economic Advisors (November 2014) shows that the current account balance had two great lurches downward in the 1980s and 1990s. Then it fell yet further the following decade, driven especially by the increasing price of oil. After 2010, the current account balance would have headed back down were it not for the shale revolution in America, which added 4.5 million barrels per day of new production in four short years. Now, with the price of oil falling by fifty percent over the last six months, there have been corresponding improvements to the US current account. But though the effect of the price collapse on the US balance of payments has been dramatic, its effect on US oil production remains very uncertain. Most forecasts foretell a stoppage of growth, not a decline of production. We shall see. 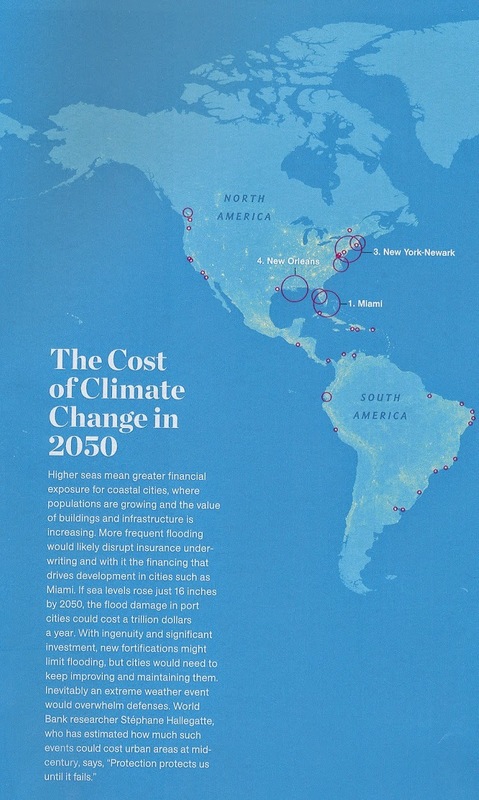 From the February 2015 National Geographic, a graphic showing potential costs to coastal cities from rising sea levels. Gideon Mendel, "Drowning World," National Geographic, February 2015, 126-27. So it used to be said. Whatever happened in California would later happen in the United States. What happened in the United States would then happen in the world. As a Coloradan, I should like to say: Say it ain't so. The next chart shows a drought measure called the SPEI, which takes account of both rainfall and heat. In weather charts, as in stock charts, it's generally not good to be on the bottom right of the panel. That means you're toast. 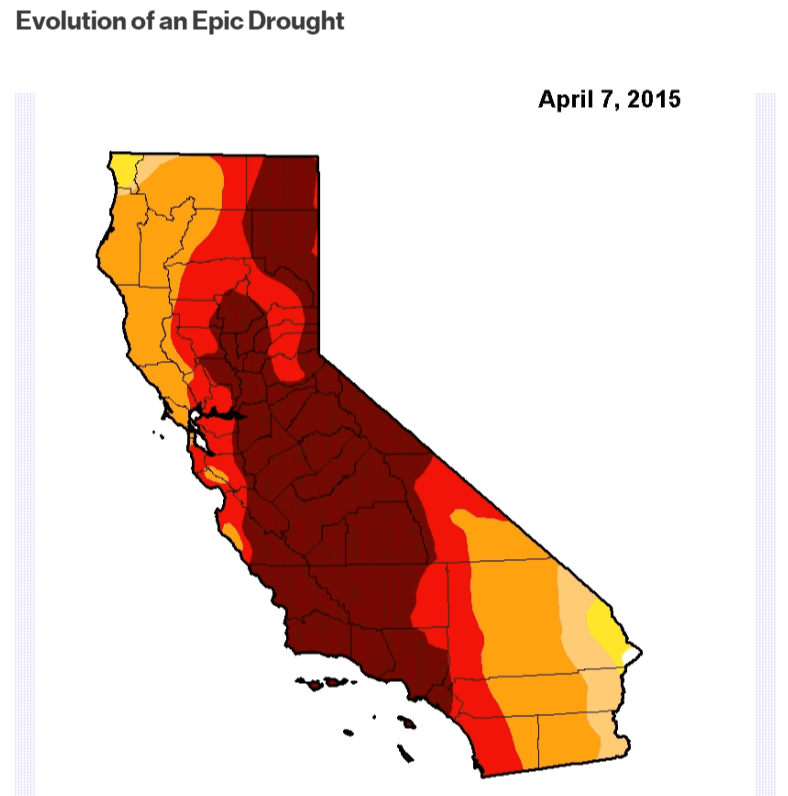 More than 44 percent of the state is now in “exceptional drought” (crimson). It’s a distinction marked by crop and pasture losses and water shortages that fall within the top two percentiles. California has seen droughts before with less rainfall, but it's the heat that sets this one apart. Higher temperatures increase evaporation from the soil and help deplete reservoirs and groundwater. The reservoirs are already almost half empty this year, and gone is the snowpack that would normally replenish lakes and farmlands well into June. 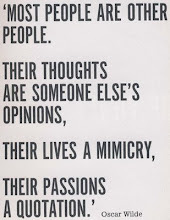 My name is David C. Hendrickson. I teach international relations and American foreign policy at Colorado College. This link will take you to my personal website at CC. Skeptics: Watts Up With That? I ADMIT IT. SO WHAT? 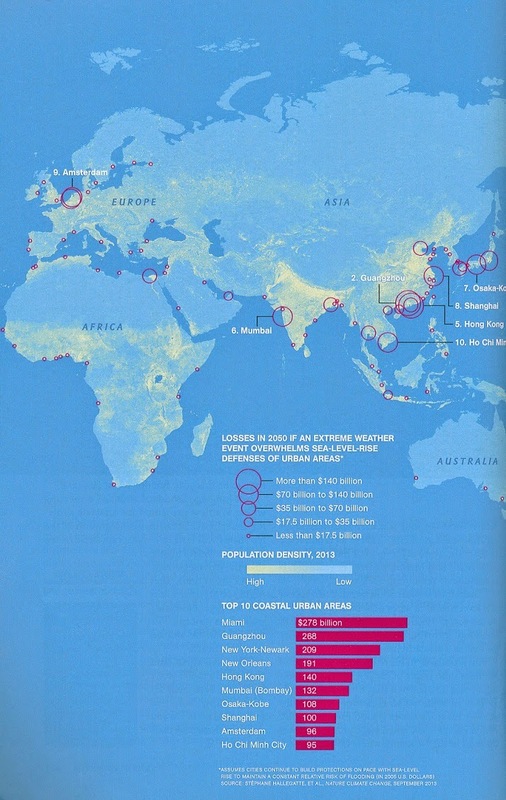 Global Climate Change Impacts in U.S.